I can't say I am wildly optimistic about this one. No Henry (again) and no Rafa, though we may well be better off without him. I like the fact that Conde is back. I love what Kenny Cooper has given us this season so far. What I don't like is our record in Bridgeview over the years, which is putrid. I'll go for a 1-1 draw. Coop gets one for us, while either Puppo or Pappa or Peepee scores for Chicago. I'm going to go with a 1-1 draw as well (if we get lucky). Chicago always seems to have our number @Toyota Park, but I think we can get out of there with a point (thanks to a KFC goal). Coach Backe said earlier in the week that he would prefer to hold back some of the guys who played in mid-week International matches. If he follows through on that, he'll be putting out the lineup that lost to Harrisburg. I gotta believe that Dane, and maybe Joel, at the very least, will see some minutes today. If we play a solid 4-5-1, or pair Dane up top with KFC, we'll put out a 2-1 victory. KFC and MFB(!) with goals. If we try any formation that involves Jhonny Arteaga, just shut off your TVs and go outside--you'll have a nicer Sunday evening for it. Game on! 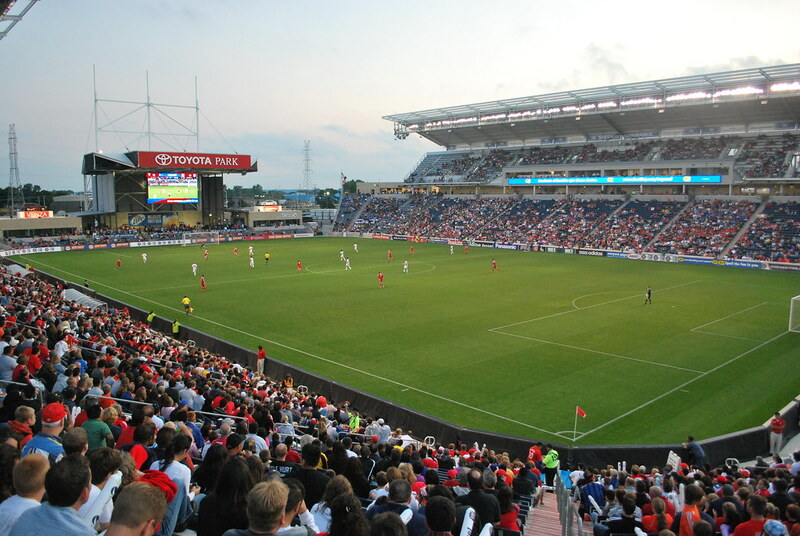 The Chicago Fire is coming off 3 of their last 4 MLS games. The Red Bulls, as we all know, have won 5 of their last 6 and haven't dropped points since the DC debacle. You have to hope both will continue their pre-break run of form. The team has proven it can win--convincingly--without TH14 or Rafa, and Conde will be back in action, so I'm calling it 2-0 for RBNY. I think our backline will suffer at least one embarassing gaffe, but have faith that Kenny F'ing Cooper can bang in a brace to pick up three points in the Windy City. Alrighty then! Let's hope for 3 points. A midweek fixture, against Vancouver, after this one, then we're back, @The Cathedral of Football, Red Bull Arena (built by Makita). C'mon You Red Bulls!